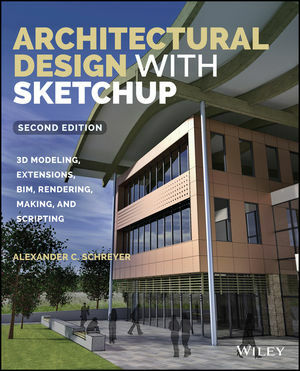 Architectural Design with SketchUp, Second Edition, is the leading guide to this incredibly useful tool for architects, interior designers, construction professionals, and makers. With easy to follow tutorials that first brush up on the basics of the program and then cover many advanced processes, this resource offers both informative text and full-color illustrations to clearly convey the techniques and features you need to excel. The updated second edition has a new chapter that explains how to make things with SketchUp, and covers 3D printing, design to fabrication, CNC milling, and laser cutting. Other chapters also now cover Building Information Modeling (BIM) and 3D web content generation. Additionally, the revised text offers insight into the latest products and plugin extensions, navigation methods, import/export options, and 3D model creation features to ensure you have an up to date understanding of how to make SketchUp help you meet your project goals. A leading 3D modeling application, SketchUp features documentation capabilities through photorealistic renderings and construction drawings. Because of its ease of use and ability to be enhanced with many plugin extensions for project-specific applications, SketchUp is considered the tool of choice for professionals in the architecture, interior design, construction, and fabrication fields. Architectural Design with SketchUp, Second Edition, is an integral resource for both students and professionals working in the architecture, interior design, construction, and fabrication industries. ALEXANDER C. SCHREYER is senior lecturer and program director of the Building and Construction Technology program and faculty member in the Department of Architecture at the University of Massachusetts, Amherst. He teaches courses in AEC BIM/CAD modeling and visualization as well as materials and methods, structural design, and 3D printing. He is an active member of the SketchUp community, speaks regularly at user conferences, and owns a popular blog at alexschreyer.net.